Most people enjoy getting freebies - especially if the only effort required is clicking a link or responding to an SMS. In an ideal world, it sounds awesome to get a free iPad for completing a survey. However, in the real world, there's always a catch. In most cases, these "freebies" are hooks to get people to part with their money or personal information, or to cause damage to users' computers, laptops or mobile devices. Hackers and scammers employ attractive methods to catch their victims. 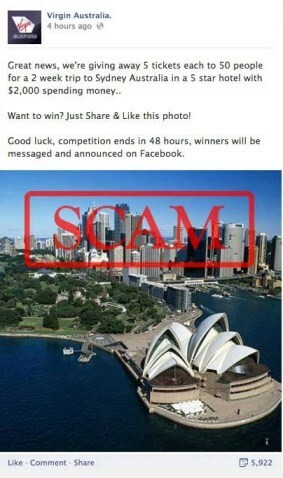 For example, there was an advert claiming that Virgin Australia (an airline company) was giving away plane tickets and cash prizes to 50 people who 'Liked' and shared a promotional image on their Facebook page. In reality, this bogus page had no relation to Virgin Australia. Scammers use this method of enticing people to share the bogus pages so that they can generate a high number of 'Likes' in a short period of time. A Facebook page with a high number of 'Likes' can be very valuable - being sold on the black market to other scammers for lucrative sums of money. By clicking the 'Like' button, you could be revealing more about yourself than what may you think. Researchers at Cambridge University have found that with the simple click of the 'Like' button, statistical models can be created to determine your IQ, emotional stability and other personality traits. Another great resource is Hoax-Slayer. It's a more general site that reports all types of scams - such as Internet and email hoaxes, petitions, bogus warnings, and fake job adverts where you need to pay an amount of money before you can start the job. Some scammers may ask you to accept payments into your personal bank account and then transfer it to a separate account provided by them. The promise that you'll get to keep a portion of the money deposited. Often, such requests are made in the context of real-life world events - such as civil wars which force the requester to get money out of the country. While such requests may seem realistic, as well as an easy way to earn some cash, money laundering is illegal and you could end up in prison if you're caught. When you receive such an email, the best thing to do is to simply delete it. A good dose of scepticism is also wise when you get an email, SMS or phone call that asks you to provide your personal information. Legitimate companies will never ask for this information over the phone. When in doubt, ask the caller their credentials and then call the company's official number to verify that the person works there. Essentially, the most important general tip to follow is: be cautious about the links you click and the information you provide to others. If you're asked to share personal information such as usernames, passwords or identity numbers via a phone call, email or social media, you could well be dealing with a cyber-criminal. Sharing such personal information could enable scammers to access to your accounts and cause havoc without you even knowing about it. They could also spread viruses and other malware on the device that you're using. Worse than that, if cyber-criminals manage to access your bank account, they could totally wipe out your hard-earned savings, leaving you with nothing at all. Never click links that you don't trust. Never click unsolicited links that ask you to provide your username and password, or promise to reset your password. Rather, go directly to the site and log in / request a password reset yourself. Never send money or give your bank details to people you don't know or trust. Always read the terms and conditions of offers before clicking I Agree. Be cautious of websites offering free downloads - such as music, adult content, games and movies. They may install harmful programs without you knowing. If you receive an email from a friend who is financial trouble and asking for money, contact them directly and check if it's true.